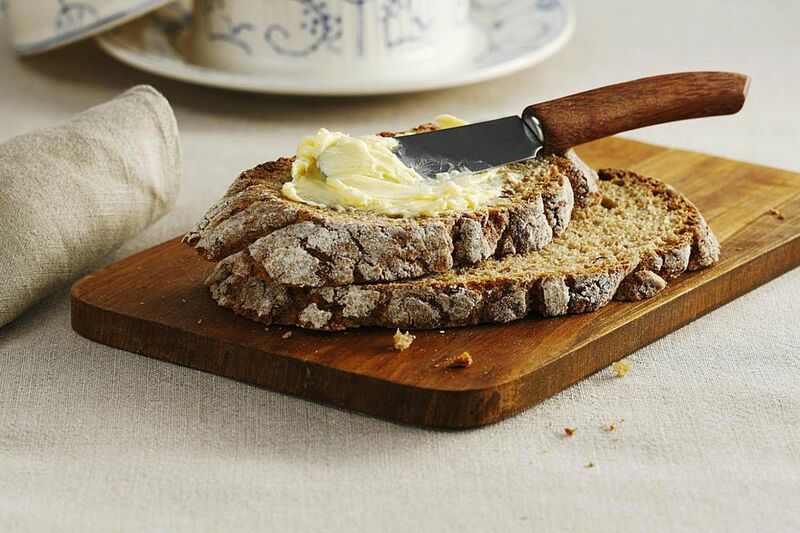 The buttermilk in this bread recipe gives the bread a rich texture and buttery flavor. You can use either fresh buttermilk or buttermilk powder. The rich taste is the same for either type of buttermilk. If you can’t get a hold of buttermilk, mix one tablespoon of vinegar or lemon with one cup milk. In a small saucepan, heat 1 cup water and 3 tbsp butter over medium heat until butter is melted. Remove from heat and allow to cool until warm. In a small bowl, add 1/2 cup warm water and the dry yeast. Stir yeast until it is dissolved. Set bowl aside and continue with the next step. In a large bowl, mix buttermilk, honey, sugar, salt, and vinegar. When the butter water is warm to the touch, pour into large bowl. Add yeast water. Punch down dough and turn out onto a floured board. Knead bubbles out of dough. Divide dough into to equal halves. For a beautiful bread, you can braid the bread dough. Use bottled spring water instead of tap water to make your bread. Water softeners and chlorinated public water can sometimes kill the yeast needed to make your bread dough rise. When honey is added to bread dough, it helps protect the baked bread's moisture.